Contrary to popular belief, teen bunions are not caused by that pointy, high heel shoe that you wore when you were 20 years old or that ill fitting cowboy boot that you wore for your one day at the rodeo. Bunions are caused by mom and dad. The foot structure that you inherit from your parents creates the biomechanical forces that cause a bunion to form. Yes, shoes and activities can make the condition worse or more painful but they are not the essential cause. There, you should feel better now! A bunion is a combination of misaligned bones and joints. Correction involves more than just "grinding off the bump." Correction involves realigning the bones and the joints and removing excess bone that may have formed. There is no "one type fits all" bunion surgery. Each condition is unique and requires varying combinations of bone and soft tissue correction. This is where the surgeon's expertise comes in. There are a number of surgical techniques available and it is important to choose the correct one for each patient. For more information contact us for a consultation. Those crooked toes are really annoying and unsightly. Whether it is for a woman embarrassed to wear an open toe shoe or a man experiencing pain because his toes rub against the top of his work boot, this condition is easily corrected. There are varying degrees associated with hammertoes. In its earliest form, the contracture is mild and the toe is flexible. Correction in this case is a simple office procedure under local anesthesia where the tendon that is pulling the toe back is released through a small 1/8" incision. The longer the toe remains contracted, the more the joints adapt and the more rigid the toe becomes. That's why it's best to have this condition corrected early on. In an intermediate form, the patient is able to straighten their toes, but not completely. Correction at this point may involve removal of a small piece of bone from the joint in order to allow the toe to straighten completely. This is done comfortably at a Surgicenter using sedation and local anesthesia. In its most severe form, the toes are rigidly contracted and the patient is unable to straighten them at all. Correction at this level may require fusion of the joint in order to straighten the toe and be assured that it stays that way. If the same procedure that is performed on an intermediate hammertoe is performed on a severe hammertoe, there is a good chance that the condition will recur two or three years down the road. Even this type of procedure is done comfortably at a Surgicenter under local anesthesia with intravenous sedation. When using the Surgicenter, the patient arrives in the late morning and the procedure is performed at lunchtime. The patient is a home for dinner but more importantly is able to walk on the foot immediately after surgery in a special surgical shoe. All too often after having the procedures performed, the patient's first reaction is, "why did I wait so long to have this done, I've been suffering for years." For more information contact us for a consultation. procedure is and you'll never have to deal with that ingrown nail again . Lumps and bumps: sometimes annoying bone spurs form and these can easily be removed. Neuromas: these are inflamed nerves that can cause burning and tingling in the toes when walking. They often respond to conservative therapy but if not, they can easily be removed in an outpatient setting. Hello my name is Danay and I'd like to say how much I appreciate having Dr. Triolo as my podiatrist. Dr. Triolo has performed bunionectomies on both of my feet and I was very pleased by his expertise. The staff at the doctor’s office is friendly, accommodating and very efficient. I can't say anything negative about my experience with the staff or Dr. Triolo. 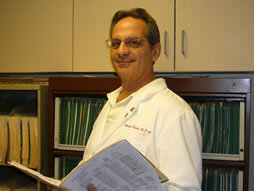 I recommend that anyone with foot trouble visit Dr. Triolo. He has a great sense of humor and a "caring touch". He really seems to love what he does and it shows. I always enjoy going to my appointments with Dr. Triolo because he is a wonderful doctor and understands my concerns. My feet are in good hands with Dr. Triolo and I want to thank him for everything! I was first referred to Dr. Triolo twenty-two years ago, when at the time, I was a children and teen beauty pageant director. As a director, it was my responsibility to train contestants in on-stage presence, which included posture, balance and the proper runway walk. Training required me to wear high heels enabling contestants to mimic my movements, inclusive of the proper positioning of legs and feet. In 1987 I found it increasingly more difficult to train due to extreme pain I was experiencing on the ball of my right foot. Following a thorough examination and x-rays of my foot, Dr. Triolo, diagnosed a Neuroma. He explained, in great detail, that, should I wish to continue training, I would have to have surgery on my foot. This is from your very satisfied patient, Timothy. I originally developed an ingrown toenail on my right foot and my wife recommended that I make an appointment to see Dr. Triolo. During my initial visit, I mentioned to Dr. Triolo that in addition to the ingrown toenail, I was having pain in both of my great toe joints. Dr. Triolo permanently cured the ingrown nail condition on the first visit and afterwards we discussed the problem I was having with my big toes. He determined that arthritis had destroyed the joints and recommended surgery to place implants in both feet. I had been having this worsening pain for several years and working in retail as a store manager required that I spend long hours on my feet. It was getting more and more difficult to get through the day because of the foot pain. I decided to go ahead with the surgery based on Dr. Triolo's assurance that he could alleviate the pain. I believe that I made a very good decision to have Dr. Triolo perform the surgery. From the moment I made the decision, his staff took care of the insurance issues, scheduled all the necessary appointments and did everything necessary to assure that I was in sufficiently good health to undergo the procedures. His staff gave me a sense of safety and assurance that I was receiving the best care possible. The Surgicenter was very efficient and had all the necessary information assembled before I entered the front door. I cannot say enough about the care I received while at the Surgicenter and the follow up care at Dr. Triolo's office. The surgery and postoperative period went extremely smooth and I was able to return to work full-time within a month. Personally I cannot say enough about Dr. Triolo’s expertise in performing the surgery and the care that I received afterwards. His calm nature and thoroughness made me feel that I had the best of care. I would like to say thank you Dr. Triolo and staff for all of the help that you gave me. After having gone through everything, I now know for sure that the surgery was the best thing best for me.